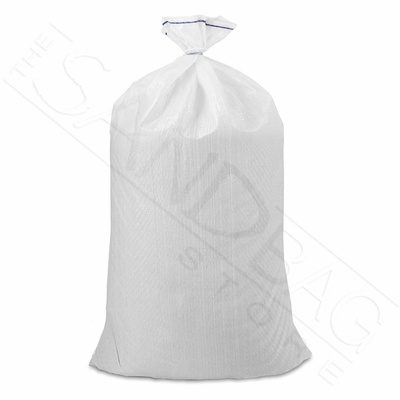 Poly Sandbag, Economy White 100 pk. Home > Standard Sandbags > Poly Sandbags > Poly Sandbag, Economy White 100 pk. $35.00 ea. $30 ea. $26 ea. $25 ea. Budget FriendlyBuilt with your budget in mind, these excellent sandbags will get the job done for the absolute lowest cost. As one of the largest sandbag manufacturers in the world, our economies of scale allow us to out produce and price sandbags below the competition. Delivered PricingHow do we make this low price even better? By shipping it to your doorstep at no cost of course. We are always happy to pay for shipping in the lower 48 states. Need the bags faster? No problem, select next-day air shipping to get your sandbags tomorrow! Orders received by 3PM EST will ship same-day. Need longer lasting sandbags? Our HD Sandbags last at least 2 years in the sun! Ace Sandbags last 3-5 years and can be printed with your logo. Want a forever option? DuraBag Sandbags last a minimum of 5 years in the bright sun! Note: To get these great sandbags to you at such low cost, economy sandbags are imported from India. Good quality bags at an exceptional price. Perfect bags for coal and soil. I had some loose coal I needed to bag. We also mix our own garden soil and these bags are great AND REUSABLE!. This is a great sandbag. Its easy to fill and has a tie string that attached to the bag for easy tie off . I highly recommend. ProsTie string is attached to the sandbag. It's lightweight but holds its shape while u fill.